This network providers are trying to turn us to night crawlers as they are gradually turning the night plan to the latest trend now. Mtn started the night plan, then airtel followed suite and now Etisalat has decided to join them. But unlike Mtn and Airtel, the Etisalat night plan comes with a completely new twist. 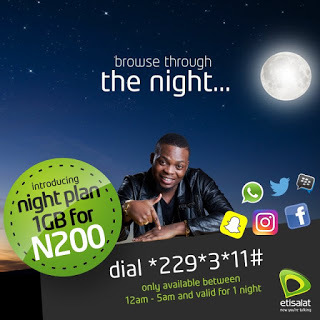 With the new Etisalat night plan, you will get 1gb for N200, and you can use it from 12a.m to 5a.m. ==> Make sure you have at least N200 on your Etisalat line. ==> Dial *229*3*11# to activate the night plan. The plan is going to be active from 12a.m to 5a.m the same night. But seriously if Mtn night plan cost N25 for 500mb and airtel night plan goes for N25 and N50 for 500mb and 1gb then why would anyone subscribe for the Etisalat 1gb and N200. I think it's a bit too expensive.